Over the last two decades, a range of affordable devices and equipment have been created that can provide the 4 billion people at the BoP with life-changing benefits. Yet, progress in marketing these devices has been frustratingly slow as marketers struggle to convince BoP families that future benefits (cost savings or increased income) justify these investments. 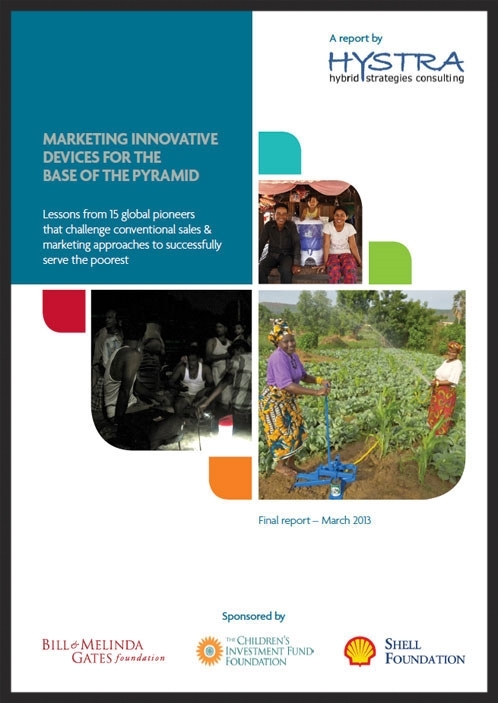 The "Marketing Innovative Devices for the Base of the Pyramid" project analyzed 15 pioneer organizations selling life-changing devices to the BoP. This report offers 10 key lessons learned on how to design an appropriate value proposition, create effective marketing strategies, organize an efficient sales force and define the right level of overheads. Benchmark your performance against leading marketers? Learn from global best practices? Engage your management team in revisiting your current sales and marketing practices? Contact us to learn about our one-week "Benchmark & Workshop" methodology.